My first visit to the SHOT Show several years back brought rumors of a new 1911 company with an old firearms tradition, Kimber. What was real big news was the price and included features on this 1911; all the neat things: good sights, extended safety, full length guide rod, F/R cocking serrations and under $600. Well production woes got them off to a slow start. All that has changed, believe you, me. At the 2000 version of the SHOT Show, Kimber debuted the Ultra CDP series, nifty OM or Commander sized 1911s with all the best in custom shop features. The list included tritium inserts, ambi-safeties, checkered front strap, excellent trigger pull, and a complete bevel package (break all and I do mean all sharp edges) to the entire 1911. What is surprising is the price the full SRP for a pistol you can take delivery of now, $1100. Before you faint lets see, $200 + for the tritium, checkering on alloy, another $200, ambis, $75-100 installed, bevel job + refinish $125-200, plus cost of 1911, and minus the two month to a year wait from your favorite pistol plumber; deal. After extended conversation with Kimber’s rep., and having down a review of the Kimber Gold match for a major publication, it was decided that I would have a CDP delivered. The goal to see if the alloy frame would hold up to abuse, not just a gunrag review’s idea of abuse. So how’s it shoot? After nearly 500 rounds of mixed factory and 500 rounds of reloads, excellent. Factory loads included Federal 185gr JHPs, Sellier & Bellot 230grFMJ, Winchester SXTs, Triton HiVel, CorBon, and Black Hills; the last three in various weights. This little Ultra CDP shoots as well as a number of full-sized GMs that I own or have shot. The Ultra CDP shot seven groups off hand at 20 yards under 2.5 inches, for a 3.5 barrel. 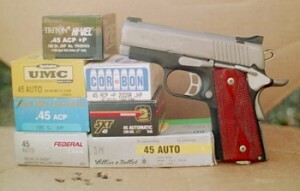 This little 1911 handled all rounds well, but the recoil was stiff, to say the least with CorBon and Triton Ammunition because of the alloy frame. This particular Ultra CDP liked 185gr Federal Hi-Shoks the best, dropping seven rounds in under an 1.25 inches–for an OM sized 1911; outstanding. So how does the Ultra CDP really hold up? After the better part of two years, it is still running. This baby 1911 has traveled in a Blade-Tech rig or a fanny pack from Eagle Industries. The Ultra has digested nearly 3000 rounds from many manufacturers and a mixed heritage of reloads. The frame is holding up well and shows no sign of cracks, of “peening” at the feed ramp. If you are looking for a great carry 1911, the Ultra CDP is the way to fly. Match grade performance out of a baby sized 1911. 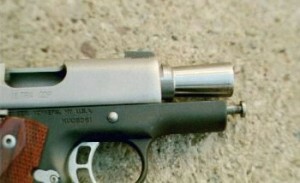 Kimber has added a Commander size 1911 to the Ultra line, it should be another great addition.